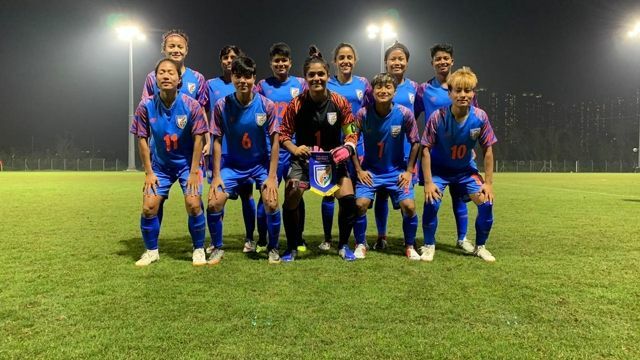 The Indian women’s football team began their outing in the Hero Gold Cup with a morale-boosting 1-0 win against Iran at the Kalinga Stadium in Bhubaneswar on Saturday. Maymol Rocky’s side had to wait till the 48th minute for Anju Tamang to score the solitary goal of last night's match. The Indian women’s football team are in scintillating form so far and continued their unbeaten run as they defeated Asian counterparts Iran in their opening game of the inaugural Hero Gold Cup. A goal from Anju Tamang in the 48th minute helped the home team to a morale boosting win at the Kalinga Stadium in Bhubaneswar on Saturday. The first chance of the match came India’s way in the second minute itself as winger Dangmei Grace latched on to a loose back-pass and raced towards the goal but the follow-up shot was not up to the mark and the Iranian goalkeeper saved the effort. After the initial scare, the visitors gradually grew into the game and began to make their way into the Indian half. The home team was upto the task and played most of their football in the midfield as both sides battled for territory. The Indians were eager to score and wasted a host of chances in front of goal. In the 30th minute after a searching ball from the right flank caused chaos in the Iranian penalty area, the ball fell to Ratanbala Devi whose shot towards goal was cleared off the line by the Iranian backline. Just before the interval, Iran caused a serious scare for Rocky’s girls after forward Sara Ghomimarzdashti ran clear towards the Indian goal but her shot was saved by Indian custodian and captain - Aditi Chauhan. India began the second half with renewed determination as Ratanbala played in Sanju who had her shot from a tight angle sail over the crossbar in the 46th minute. The same pair was involved in the next attack which ultimately led to India’s first goal of the tournament. Sanju was played in behind the defence and with an excellent first touch she drew out the rival goalkeeper. With her second touch, she then squared the ball to Tamang, who put the ball in back of the net and give India a deserving lead. Iran applied more pressure after conceding but the Indian defence managed to keep another clean sheet. The centre-back pairing of Ashalata Devi and Sweety Devi were excellent in their positioning, while Aditi was calm in handling the ball and marshalled her troops well.